Recently I have shown my son how to play Go. He was five years old by that time. I tought it would be very hard to teach such a young kid the basics of go, but I was surprised by the speed they pick-up things at that age! He likes games very much and is always interested if I replay some go-games at home. He also likes boardgames a lot but I've never tried anything "abstract" like Go. I didn't use any special teaching method. I've just explained the purpose (fence-off as many points as you can) and explained the capture of one, two and three stones. I did not introduce the ko-rule or the concept of eyes. After that introduction of 5 minutes, we started-off at a 9x9 board with 5 stones handicap. In the beginning, if I did put one of his stones atari, I told him "I am going to get you!" and immediately he extended his stone. I was also surprised that I didn't have to warn him (exept for a few times) for auto-atari. I saw him pointing at the board and thinking... If I play here, dady is going to get me! One of the problems however was the connection of groups. 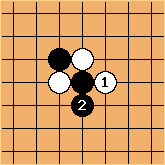 I had to explain realy a lot that groups were only connected by the lines on the board and not diagonally. After the third game he started the opening as follows.... already very difficult to follow-up! I was impressed! The group looks like it has two eyes, already a difficult concept by itself. 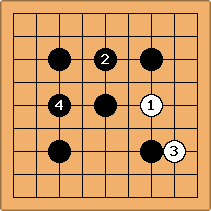 It is very well possible to teach a five-years-old the game of go. Most of the concepts they understand very fast. I hope the more difficult concepts will become second nature if we play more games. I am very interested in the experience of other people in teaching small kids the basics of go.